This is a community hospital property. 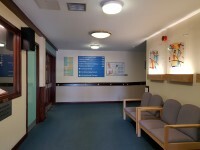 Services within the building include: Athelon Ward, Hadley Unit, Holt Ward and Occupational Therapy. 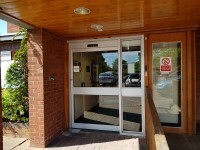 Elgar Unit, Wulstan Unit and Child and Family Services are located on Newtown Road within the Worcestershire Royal Hospital and can be accessed by the M5. 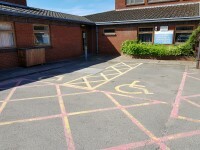 Elgar Unit has a car park for staff and visitors with 2 Blue Badge bays. 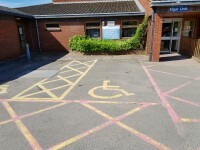 The Wulstan Unit and Child and Family Services has its own car park with 2 Blue Badge bays. The nearest bus stop is located on Newtown Road with routes 38, 350, 356 and X38 operating here. The nearest train station is Worcester Shrub Hill which is approximately 2.1 miles away. Please see the links below for the bus providers near Elgar Unit and Wulstan Unit. Please see the links below for the train providers for Worcester Shrub Hill. 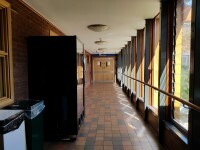 There is a wheelchair to borrow to aid transferring around the building. Water bowls for assistance dogs are not available. 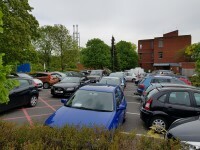 The car park is located at the front of the Main Entrance. 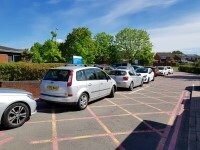 There is/are 2 designated Blue Badge parking bay(s) within the car park. The dimensions of the designated Blue Badge parking bay(s) surveyed are 311cm x 544cm (10ft 2in x 17ft 10in). 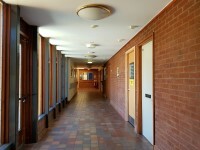 The surface on the approach to the entrance is concrete. The nearest designated Blue Badge parking bay is approximately 4m (4yd 1ft) from the Main Entrance. The width of the door opening is 113cm. You are on Getting Around The Building. Skip to the next section. 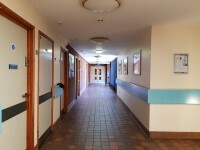 There is a steep slope, with handrails on both sides, for access to right side of the building leading to the wards. The slope is shown in photo six. 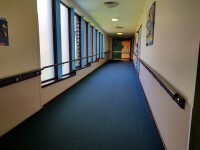 The type of flooring in walkways and corridors is carpet and vinyl. 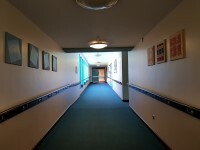 Handrails with a rounded or oval profile are provided in some corridors. This venue does not play background music in public areas. 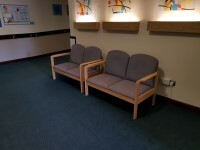 You are on Waiting Area(s). Skip to the next section. There is a/are waiting area(s) along the circulation route(s). The seats have an armrest on one side only. 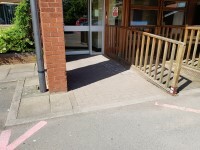 There is sufficient space for a wheelchair user to use the waiting area(s). There is not a/are not flashing fire alarm beacon(s) within the waiting area(s). You are on Accessible Toilet(s) (Left Hand Transfer). Skip to the next section. There is an/are accessible toilet(s) within this venue designated for public use. 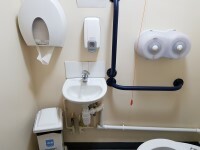 This accessible toilet is located on the left side corridor next to Occupational Therapy. 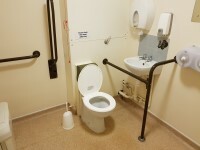 This accessible toilet is approximately 8m (8yd 2ft) from the Main Entrance. 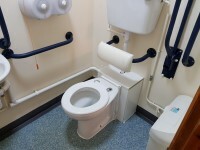 The dimensions of the accessible toilet are 188cm x 215cm (6ft 2in x 7ft 1in). The lateral transfer space is 93cm (3ft 1in). There is a/are female sanitary and general domestic waste disposal units. There is not a standard shelf within the accessible toilet. The height of the toilet roll holder is 103cm (3ft 5in). The height of the wash basin is 84cm (2ft 9in). The height of the soap dispenser is 120cm. The height of the towel dispenser is 125cm (4ft 1in). 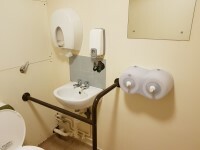 The contrast between the wash basin wall-mounted grab rail(s) and wall is good. Lighting levels are not at least 100 lux at floor level. The shared toilets that were surveyed are located just outside the Athelon Ward. 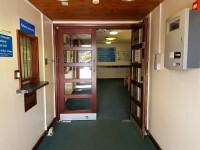 The shared toilet(s) is/are approximately 26m (28yd 1ft) from the Main Entrance. There is written text signage on or near the toilet door. There are vertical grab rails on both sides of the seat and a horizontal rail on the left. Lighting levels are at least 100 lux at floor level.